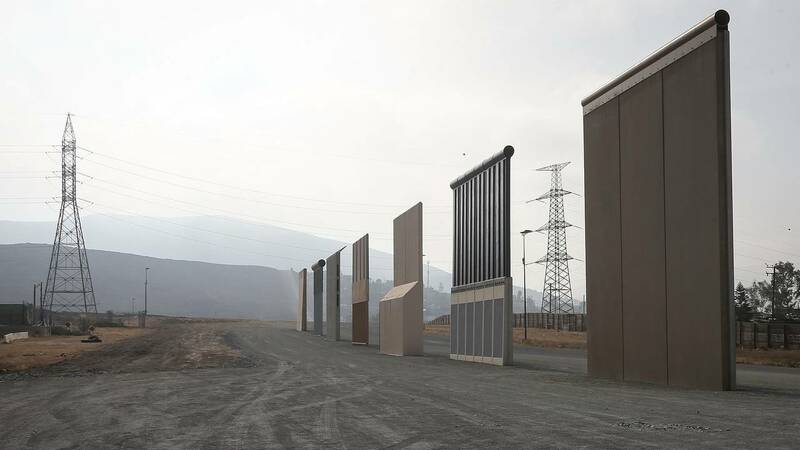 Even if everything goes according to plan, it will likely be months before construction on President Donald Trump's sought-after border wall can even start, according to senior defense officials. Trump recently declared a national emergency on the southern border, a move that in theory will allow his administration to tap and repurpose more than $3 billion in military construction funds to build sections of the wall. The declaration has been challenged by several states and some members of Congress. Trump also said that his administration would use the Pentagon's counter drug fund to build sections of the wall. But even if the court and congressional challenges do not slow the process, defense officials say it will still be many months before the funds in question could be used to build a wall. Senior Defense officials said Friday that the Defense Department is currently awaiting a request from the Department of Homeland Security to provide support for border wall construction. "We've asked DHS for input, facts, priorities, we are waiting to receive those, when we do we are going to process that, when I say process that we'll match that with our mission analysis and begin the process," Acting Secretary of Defense Pat Shanahan said Thursday, adding that the Pentagon would brief Congress on the way forward on Friday. While the defense secretary is required by law to make a determination that any military construction funds tapped for a border wall are being used to support the armed forces, defense officials say that there is no real criteria on which to make that determination. "There are not formal criteria for that assessment," a senior defense official said Friday, adding that Shanahan "will make a very deliberate decision per the law but the law does not proscribe explicit criteria." The officials said that that assessment period alone could take weeks. "We're talking a matter of weeks for the assessment leading up to the decision by the secretary and then we're looking at months for the actual implementation to the point of construction, breaking ground, and then we're talking longer than months for the completion of the construction," the senior defense official said. In addition, while the Trump Administration has said that it intends to use some $2.5 billion from the Pentagon's counter drug fund to help pay for the wall, defense officials said that there is currently less than $80 million available for the wall in that account. Therefore the Trump administration would have to cut money from other defense accounts and reprogram those funds into the counter drug pot so that the money could be used for border fencing. While the senior defense official said that that "it has been the practice of the Department of Defense to request approval" from Congress prior to reprogramming funds, he added that "it's not required by law," declining to say whether the Pentagon would seek approval to divert money toward the wall. "DHS indicated to us that they will be providing to us a request for assistance for construction of fences, lighting, roads in support of their drug enforcement mission, all of their high priority designated sections of the border for which they have assessed barriers are most important all of those key areas are also designated or they will designate them as drug smuggling areas, corridors which meets the obligation of the law," a defense official said. Once Shanahan makes his determination, the projects are approved and the necessary funds are identified and reprogrammed by the Comptroller, the US Army Corps of Engineers will begin the "expedited contracting and acquisition process," awarding contracts and obligating initial funds the official said. "DHS completes the environmental assessment and requests and grants DoD sufficient access rights to permit construction, DoD requires those access rights in order to be able to legally do the construction. Then the Army Corps will mobilize the contracting support, obligate the remaining funds and begin the construction," the official added.